What was the first high-definition home video format available to consumers? Created by JVC, Hitachi, Philips and Matsushita, D-VHS was introduced in 1998 and was capable of showing movies in high resolutions including 1920x1080 and 1280x720 while D-VHS VCRs could record from 480p to full 1080i with an external DTV tuner in addition to being backward compatible with all the standard VHS and S-VHS tapes already in circulation. When D-VHS was released, there was no other high-definition recording or playback system for consumers. DVD players at the time couldn't handle high definition video and it was only in 2004 that prototypes of consumer high-def DVD recording/playback devices began appearing at trade shows. In the event that you attempt to watch an old D-VHS tape, note that manufacturers JVC and Mitsubishi never resolved compatibility differences and tapes recorded on hardware made by one can't be played by the other. 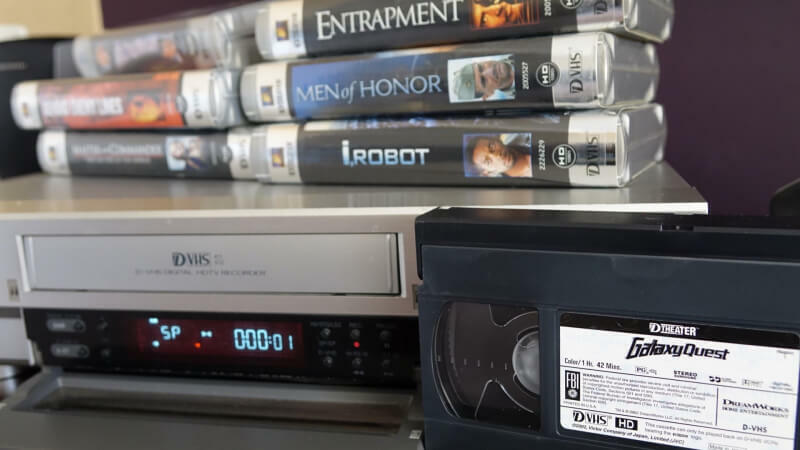 Also after 2002, prerecorded D-VHS cassettes were sold under the brand name D-Theater and those tapes won't play in D-VHS decks without the D-Theater logo.